Since becoming parents, what we've been told more than anything is that time goes by so quickly. We can't even believe how true that has been. 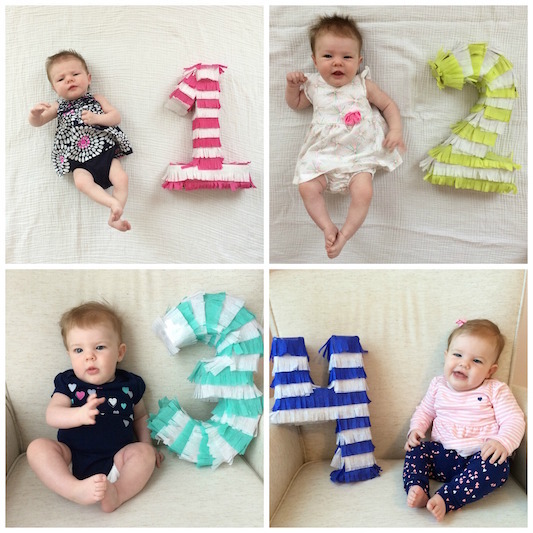 A year ago yesterday we found out that I was pregnant, and today our sweet Madeleine turns 4 months old! It has gone by so incredibly fast. We love this girl more than words can say! She was an extremely squirmy infant, and she has only gotten more and more wiggly! Madeleine does not like to sit still and loves to play, be read to, be sung to, and just be with her Mommy and Daddy. She loves being outside and gives us the best smiles. Madeleine adjusted to a good schedule early on, and that has helped her to be a very happy and content baby. After a rough start to nursing, we are very thankful that she is now a good eater! She also has been sleeping through the night since she was 11 weeks old. This girl makes us laugh so many times a day. Our lives our fuller because of Madeleine, and we praise God for giving her to us!